If you are missing one to three consecutive teeth, a dental bridge can restore the form and function of your smile. At Demille MacKay Dental in North Salt Lake and West Valley City, UT, we offer both traditional dental bridges and implant-supported bridges. By anchoring your prosthetic to healthy adjacent teeth or to permanent dental implant posts, Dr. Christopher Demille or Dr. David MacKay can literally bridge the gap in your smile. Dental bridges can restore your comfort when eating, improve your appearance, and renew your sense of confidence. Our dentists use ultramodern restorative materials to provide durable and lifelike bridges. In addition, they perform all aspects of implant dentistry, including surgery, in house for the convenience of their patients. Dental bridges are medium-sized restorations designed to replace one or more missing teeth. Once in place, the prosthetic can improve your appearance as well as your dental function. Prior to placing a restoration, Dr. Demille or Dr. Mackay will perform a thorough examination and evaluate your dental health to determine the most suitable type of bridge for your needs. A traditional bridge will be affixed to the adjacent teeth; therefore, these teeth must be strong and healthy enough to uphold the bridge. Dental implants, on the other hand, require a sturdy jawbone for support. If you have been missing teeth for a significant period of time, you have likely suffered bone recession, and you may not qualify for an implant-supported bridge. Frequently, however, our dentists can perform a bone graft or sinus lift to restore your candidacy for dental implants. Dental bridges are medium-sized restorations designed to replace one or more missing teeth. Once in place, the prosthetic can improve your appearance as well as your dental function. If you opt for a traditional bridge, Dr. Demille or Dr. MacKay will need to reshape the adjacent—or abutment—teeth. Your dentist will administer local anesthesia, and he will use conservative techniques to preserve as much of your teeth as possible. 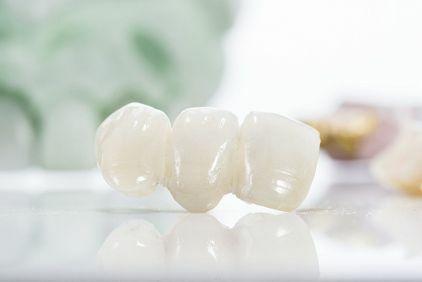 After the abutment teeth have been reshaped, your dentist will take impressions of your teeth and gums to ensure your prosthetic fits as securely and comfortably as possible. If your bridge is between one and three units long, we will typically use our CEREC® milling machine to fabricate the restoration. This digital scanner can capture virtual, 3-D impressions more accurately than a manually created model. With these impressions, the milling machine can carve your bridge from a single block of natural-looking porcelain. Thus, we can often design and place your restoration in a single appointment. If you decide to receive an implant-supported bridge, your dentist will first need to perform implant surgery. Your practitioner can place traditional or mini posts in areas where they will have the greatest amount of support. Following a four- to six-month healing period, your dentist can secure your permanent restoration in place. The restoration can fill in the gap between teeth to give you a complete and more youthful smile, simultaneously filling out your lips and cheeks. The bridge can help you achieve a complete, balanced bite. In many cases, it can restore your ability to eat certain hard-to-chew foods, such as whole fruits. An implant-supported bridge can restore your dental function even more effectively, since the implant posts will function as replacement tooth roots. Your prosthetic may improve your speech, particularly if you are missing your front teeth. When you select an implant-supported bridge, the implant posts will prevent jawbone recession, further tooth loss, and a dramatically changed appearance. With your renewed smile and dental function, you could also enjoy a greater sense of confidence. With our state-of-the-art dental restorations, there is no reason to hide your smile. Contact our office online to learn more about our dental bridges. You can also reach our West Valley City office at (801) 969-3025 or our North Salt Lake location at (801) 397-5262.